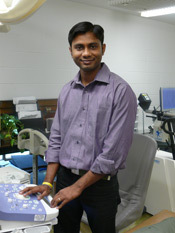 Sushant Ranadive is a doctoral student in the Department of Kinesiology and Community Health. What are your general impressions of your graduate program and the KCH department? The KCH department at the U of I has a very unique and diverse composition of graduate programs. The graduate program for Exercise Physiology is well designed which gives students detailed insight into the physiological aspects through course work and lab experience. The faculty works as a team not only for the teaching, but also for the research projects. Hence, a graduate student learns a holistic approach to Exercise Physiology. What has been your most interesting experience at the University of Illinois? I would have to say that serving on Student Committees and gaining some insight into the administrative aspect of a University has been my most interesting experience at the U of I. Briefly describe your research focus. My research focus is on exercise and inflammation and how it affects the cardiovascular system in humans. I am presently working on an American Heart Association-funded fellowship project which looks at the protective effects of aerobic exercise on vaccine induced inflammation. My immediate plan is to join a research lab with a post-doctoral fellowship for another 2-3 years. Following that I would like to join the academic field. Riding my bike around Champaign and canoeing downstream in Kickapoo Park are some of the fun activities for me. Why would you recommend graduate studies in KCH to others? KCH at the U of I is one of the top-ranked departments in the country. The department offers a learning experience which I claim to be "Unity in Diversity." Within the department there are research projects and labs which are very diverse but they always collaborate for various research projects, which not only helps increase the funding opportunities, but also teaches the students to get along and play in harmony within the sandbox.